4. Take the pan off the heat, remove the sugar thermometer and plunge the bottom of the pan into the sink of cold water to stop the mixture cooking any further. Add the butter, give the fudge a gentle stir and scoop it into a large mixing bowl. Leave undisturbed to cool to room temperature for about 15–20 minutes, without being tempted to stir or taste the cooling fudge. 5. Using a wooden spoon or rubber spatula, beat the fudge for 3–4 minutes until the mixture thickens, starts to lose its shine and begins to turn slightly grainy. Add three quarters of the chopped pecans and spoon the fudge into the prepared tin, spreading it into an even layer with a palette knife. 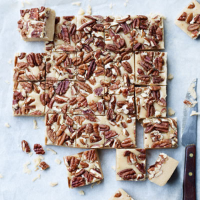 Scatter the remaining pecans over the top, pressing them into the fudge. 6. Leave to set overnight before cutting into squares to serve.